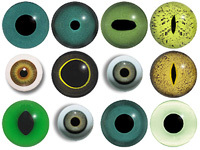 We have 6 eyes to suggest for you. Acrylic Tawny Owl Eyes eyes. 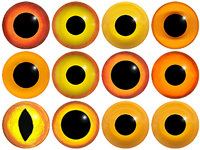 This revolution in bird eye technology was created by award winning taxidermist Erling Morch. Created in crystal clear acrylic this natural looking eye has an accurately blended iris and a beautifully feathered pupil set at the correct depth to give the most natural all round look. Acrylic Long Eared Owl eyes. This revolution in bird eye technology was created by award winning taxidermist Erling Morch. Created in crystal clear acrylic this natural looking eye has an accurately blended iris and a beautifully feathered pupil set at the correct depth to give the most natural all round look. European Eagle Owl Multicoloured Eyes. This glass eye on wire has a multi-colour iris with a black pupil. Ideal for stickmaking and Decoy carving. Acrylic Little Owl eyes. This revolution in bird eye technology was created by award winning taxidermist Erling Morch. Created in crystal clear acrylic this natural looking eye has an accurately blended iris and a beautifully feathered pupil set at the correct depth to give the most natural all round look. Acrylic Short Eared Owl eyes. This revolution in bird eye technology was created by award winning taxidermist Erling Morch. Created in crystal clear acrylic this natural looking eye has an accurately blended iris and a beautifully feathered pupil set at the correct depth to give the most natural all round look. 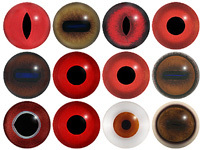 Special Offer Tawny Owl Multicoloured Eyes. This glass eye on wire has a multi-colour iris with a black pupil. Ideal for stickmaking and Decoy carving.